Better known for rural subjects, Pissarro came to paint urban scenes only late in his career after eye problems prevented him from working outdoors. He rented rooms that afforded him views into the streets of Rouen, Paris, and other cities. Probably influenced by Monet’s series paintings, he set up a number of easels to work simultaneously on different canvases as light and weather conditions changed. This is one of twenty–eight views he painted of the Tuileries Gardens from a hotel room in the rue de Rivoli. The buildings depicted are part of the Louvre. With this sidelong view, dappled with shade and interrupted on all sides of the picture frame, Pissarro’s composition captures the restless activity of the busy city. His quick brushwork seems to mimic the action it depicts. Notice the wheels of the carriages and buggies, where scoured circles of paint trace motion. With the movement of his brush, Pissarro does not simply paint but reenacts the wheels’ rolling progress. This painting, done more than a quarter century after the first impressionist exhibition, still has the same fresh energy of those early impressionist works. By inheritance from the artist [1830-1903] to his wife, Mme. Camille [Julie] Pissarro; (Pissarro sale, Galerie Georges Petit, Paris, 3 December 1928, no. 44); purchased by Van Riel. Bruno Stahl [1892-1958], Berlin, later Brussels and New York; sold 5 January 1949 to (Wildenstein & Co., London, New York and Paris); sold 30 March 1949 to Ailsa Mellon Bruce [1901-1969], New York; bequest 1970 to NGA. According to annotated sales catalogues, copies in NGA curatorial records. This painting was confiscated by the ERR in France during World War II, with other objects from the Stahl collection that were stored in a bank vault with objects from the Wildenstein collection (ERR card UNB331, as Ansicht des Louvres, Paris. National Archives RG260/Property Division/Box 22, copy in NGA curatorial files). The collection was likely established by Bruno's father, Heinrich Stahl [1868-1942] of Berlin. Bruno left Germany for Brussels in 1933 where he remained until 1940. He and his family eventually emigrated to the United States after 1941. 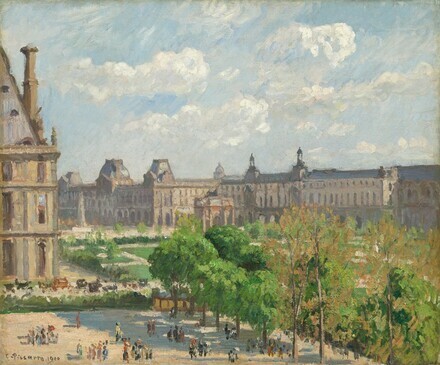 The Pissarro was transferred to the Jeu de Paume and taken by Hermann Goering on 17 March 1941, as Louvreansicht, (No. 20 on the Nachtrag zur Liste v. 20.10.42 der für die Sammlung des Reichsmarschalls Hermann Göring abgegebenen Kunstgegenstände dated 9 April 1943 in OSS Consolidated Interrogation Report #2, The Goering Collection, Attachment 5, National Archives RG239/Entry 75/Box 85, copy in NGA curatorial files). Goering traded the picture to Gustave Rochlitz in exchange for a Raffaellino del Garbo and a Wouters (OSS Consolidated Interrogation Report #1, Activities of the Einsatzstab Reichsleiter Rosenberg, p. 30, National Archives RG239/Entry 75/Box 85, copy in NGA curatorial files). The painting remained with Rochlitz, in whose possession it was found after the war (Detailed Interrrogation Report #4, Gustave Rochlitz, p. 9, National Archives RG239/Entry 74/Box 84, copy in NGA curatorial files). The painting was restituted to France on 27 March 1946 (Munich property card #8040/6; French Receipt for Cultural Objects no. 5A, item no. 289, copies in NGA curatorial files). It was exhibited in 1946 in Les Chefs-d'oeuvre des collections privées françaises retrouvés en Allemagne par la Commission de Récuperation artistique et les Services alliés, no. 33. It was restituted to Wildenstein, from whose vault it had been removed, on 24 October 1947, and returned to Stahl that same year. Stahl sold the picture to Wildenstein on 5 January 1949. See letter from Wildenstein dated 31 January 2001 in NGA curatorial files. Bill of sale from Wildenstein dated 30 March 1949, in NGA curatorial files. Pissarro, Hayward Gallery, London; Grand Palais, Paris; Museum of Fine Arts, Boston, 1980-1981, no. 86, repro. Capolavori Impressionisti dei Musei Americani, Museo e Gallerie Nazionali di Capodimonte, Naples; Pinacoteca di Brera, Milan, 1986-1987, no. 38, repro. Impressionist and Post-Impressionist Masterpieces from the National Gallery of Art, Washington, State Hermitage Museum, Leningrad; State Pushkin Museum of Fine Arts, Moscow, 1986, no. 24, repro. Impressionisti della National Gallery of Art di Washington, Ala Napoleonica e Museo Correr, Venice, and Palazzo Reale, Milan, 1989, unnumbered catalogue, repro. Französische Impressionisten und ihre Wegbereiter aus der National Gallery of Art, Washington und dem Cincinnati Art Museum, Neue Pinakothek, Munich, 1990, no. 43, repro. The Impressionist and the City: Pissarro's Series Paintings, Dallas Museum of Art; Philadelphia Museum of Art; Royal Academy of Arts, London, 1992-1993, no. 89, repro. 121, as Place du Carrousel, the Tuileries Gardens. Impressionists in Town, Ordrupgaardsamlingen, Copenhagen, 1996, no. 23, fig. 63, as Place du Carrousel, the Tuileries Gardens. Around Impressionism: French Paintings from the National Gallery of Art, Los Angeles County Museum of Art, 1999, no cat. Masterpieces from the National Gallery of Art, Washington, Kyoto Municipal Museum of Art; Tokyo Metropolitan Art Museum, 1999, no. 48, repro. Impressionist and Post-Impressionist Masterpieces from the National Gallery of Art, The Museum of Fine Arts, Houston; The National Art Center, Tokyo; Kyoto Municipal Museum of Art, 2011, no. 39, repro. The Art of the Louvre's Tuileries Garden, High Museum of Art, Atlanta; Toledo Museum of Art, Ohio; Portland Art Museum, Oregon, 2013-2014, pl. 56, as The Carousel Courtyard (La place du Carrousel). Kunstler, Charles. "Camille Pissarro." La Renaissance 11, no. 12 (December 1928):506, repro. Pissarro, Ludovic and Lionello Venturi. Camille Pissarro, son art, son oeuvre. 2 vols. Paris, 1939:1:239, no. 1136, as La Place du Carrousel, Tuileries; 2:pl. 225. European Paintings: An Illustrated Summary Catalogue. National Gallery of Art, Washington, 1975: 272, repro. Walker, John. National Gallery of Art, Washington. Rev. ed. New York, 1984: 511, no. 763, color repro. European Paintings: An Illustrated Catalogue. National Gallery of Art, Washington, 1985: 315, repro. Coman, Florence E. Joie de Vivre: French Paintings from the National Gallery of Art. Washington, 1991: no. 8, repro. Pissarro, Joachim and Claire Durand-Ruel Snollaerts, Pissarro: Critical Catalogue of the Paintings, 3 vols., Milan, Paris and New York, 2005: III:no. 1330, repro.